Between 2013-2016 I wrote 164 articles for Forbes as a Forbes contributor. [Note: Contributors at Forbes are unpaid writers, domain experts with day jobs, as opposed to staff writers who are full time employees of Forbes. More on this model here, here, and here.] It has been rewarding for both my personal brand and my digital marketing agency, MWI. It has led to other writing opportunities with publications like Time, Mashable, TechCrunch, Entrepreneur, Venture Beat, Fortune, ClickZ, Search Engine Land, and the South China Morning Post, to name a few. I loved doing it (I stopped writing for Forbes in early 2016), and am grateful to have had the opportunity. I got lucky. I never asked “How do I become a Forbes writer?” The opportunity came to me through a friend and was dropped in my lap. However, since I started writing for Forbes, “How can I write for Forbes?” has become the most common question I’m asked. Let me tell you how it happened for me, and then I’ll tell you how you can make it happen for you. I started blogging around 2001. I have always loved writing. I write for myself, primarily, and to this day am always pleasantly surprised to discover that anyone else reads, let alone enjoys reading, what I’ve written. I do not consider myself as a true journalist, although I have referred to myself as one in order to get into events for free. I consider myself a rank amateur, someone who is virtually untrained. Yet I love to write, and will take any opportunity to do more of it. For over 10 years this blog was the only outlet I had for my writing, with a few minor exceptions. That all changed in early 2013. I was in a meeting with my friend and fellow Forbes contributor Cheryl Conner and asked her “How did you start writing for Forbes?” I was merely curious. I thought it was pretty cool that she had that platform for getting her ideas out. Cheryl explained the contributor model to me, and told me that her editor, Tom Post (recently moved on from Forbes), would be in town soon and she would introduce me to him. I didn’t think too much of it, but figured it would be a good opportunity. Little did I know. I met Tom at an event at Weber State University in Utah, where the topic was the future of digital journalism. Tom spoke, and afterward Cheryl introduce me to him. I was surprised when he said “I’ve read your blog and the article you published on Fast Company,” (Cheryl had recently helped me get that published there). Tom continued, “I wish that Fast Company article had been in Forbes. I’d like you to write for us and post the same type of content on Forbes that you post on your own blog.” I was surprised and flattered. I hadn’t expected Tom to know who I was at this point, let alone have read my work and be prepared to give me this opportunity. I told him I’d love to write for Forbes, and that was the beginning of it all. 164 articles later, I’m no longer publishing work on Forbes, at least not directly (I still occasionally pitch articles to other writers there on behalf of clients), and I provide coaching services for influencers who want to grow their personal brand, which often includes becoming a contributor to Forbes. I’ve helped people get into contributor positions at many publications including Forbes, Mashable, and Entrepreneur. Getting in can take a lot of work and more than one try. Here are my best tips on how to make it happen. Love writing. My writing at Forbes has led to over $2M in revenue for my marketing agency, but you may never make a dime by writing for Forbes, directly or indirectly, and you shouldn’t do it with dollar signs in your eyes. If you write for money, you won’t write very well, and you won’t get the results you want. If you don’t love writing for its own sake it will become a burden rather than a blessing. The majority of those who thrive as contributors like to write. Write a lot. Showing a Forbes editor that you’ve written 3-4 blog posts isn’t enough. Showing that you’ve written 100 blog posts, and several pieces that have been published elsewhere, is much better, although you can get in with less. One of the things Forbes wants to know is whether you will produce a piece every week. That’s 52 articles per year. It’s a lot of work. What evidence can you show to prove you’re up to the task? Read a lot of Forbes posts. Especially the popular ones. This will give you a good idea of what works on Forbes and what doesn’t. Collaborate and develop relationships with other Forbes contributors. Reach out to those who are already writing for Forbes and offer to help them with their writing. Offer to help them with research, interviews, and other building blocks of articles. 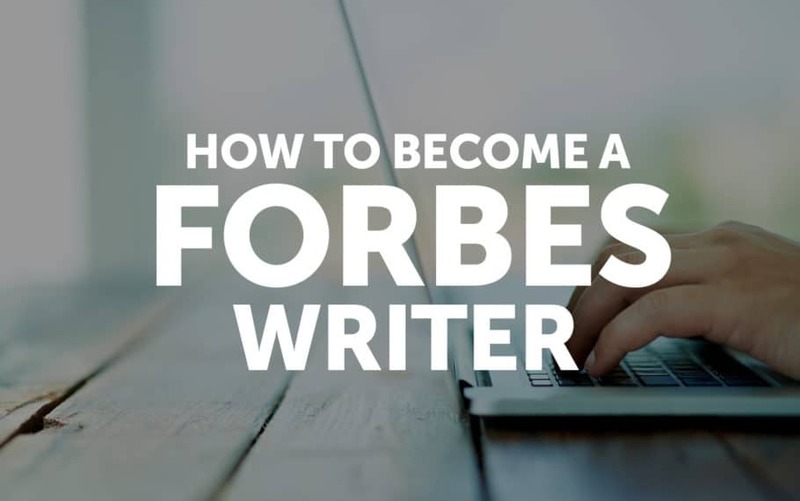 This will give you more insight into how the process works, and you’ll then be able to pitch yourself as having assisted other Forbes writers in putting together pieces. There’s a good chance you’ll end up getting quoted in an article or two along the way, which doesn’t hurt when it comes time for pitching. Choose a focus. At Forbes there are different sections, each run by a different editor. Are you going to write for the Entrepreneur section, the Lifestyle section, or the CMO Network (marketing) section? Choose one, because if you try to get into more than one you won’t get in to any. But don’t stop at choosing a section, you also need a topic within that section. You’ll need to focus on IoT in Asia, or small business HR, or tech VC funding. If you pitch yourself as just IoT, or HR, or VC, it’s too vague, you need to zoom in more. Prepare your posts for pitching. Create three posts that you think are worthy of being on Forbes. Get personal and vulnerable. Share secrets. Give your best tips. Provide massive value. Share your experiences where it may help others, but DO NOT MAKE IT ABOUT YOURSELF. It’s not about you, it’s about the reader, and what the reader wants. Write for the reader without any thought of what you’ll get in return. And for good heavens, check your spelling and grammar! If you need help hire an editor or invest in Grammarly. Know what to expect. Forbes wants one article per week. You don’t get paid. You need to know how to use WordPress. There is no pre-publishing editorial–you’re expected to write, edit, proofread, and publish all by yourself. Forbes will review your article after you post and sometimes makes minor adjustments, but in my experience this is rare. Forbes provides great group trainings, but don’t expect a lot of one on one attention. 99% of what Forbes gives you is a platform, it’s mostly up to you to figure out how to utilize it. You are now well prepared to pitch yourself as a contributor to Forbes. Let’s do this! Get an introduction. Unless you truly have no other option, don’t pitch an editor you’ve never met through LinkedIn or with a cold call or email. Get an introduction from another contributor with whom you have a relationship. This last part is key–if you and I have never met, never talked, and you email me and ask “Josh, can you introduce me to an editor at Forbes?” I’m going to tell you no. I’m going to reject you because if I gave you an introduction the first thing the editor would ask is “How do you know this writer?” and then I would have to tell him, “I don’t, he just emailed me, I don’t know him at all.” This would hurt your chances, rather than helping. It’s also not going to work if you email me and say “I’d like to develop a relationship with you so that you will introduce me to an editor at Forbes.” If I have to explain to you why this isn’t a good approach, then you don’t have the self awareness to be a good writer. Real relationships take time. They require that you give value first. They require that you don’t do it just to get something in return. Pitch the posts you’ve written just for Forbes. Don’t copy and paste the full text into an email. Attach Word docs or link to Google docs. I prefer Google docs myself, but if you send a Google doc to an editor make sure the doc has sharing settings so that anyone who has the link can view it, otherwise the editor will have to request access and you don’t want that friction in your pitch. Show your best past work. Include a link to your own blog or posts you’ve written on other publications. Tell the editor “This is some of my writing that I think best represents what I can produce for Forbes,” and then link directly to 3-4 of your most compelling pieces. Bonus tip: Don’t just paste a URL, put the title of the article in your email and link the title. There’s nothing compelling about a link by itself, but one of your titles may catch the editor’s attention and make him click. Show your best, relevant work. Your best work may not be appropriate for Forbes. Don’t pitch that. You want the editor to read what you’ve sent and think “Wow, I wish this were on Forbes. This would be perfect!” That will only happen if your writing is something the editor could see copying and pasting onto Forbes. Follow up, wisely. Send in your pitch, and then wait a week. Don’t be a pest. Don’t be annoying. Don’t hound. The editor doesn’t owe you anything. He doesn’t owe you a position as a contributor. He doesn’t even owe you a response. You’re not doing him a favor, he’s doing you a favor by even opening your email. If you don’t receive a response after a week, check the editor’s Twitter to see if he’s posted within the past week. Maybe he’s on vacation or a business trip. If he seems active and in the office, send a polite follow up by responding to your own email, “Hey, just wanted to make my email didn’t end up in your spam filter, thanks!” is enough. There are 1,500 contributors at Forbes. That might sound like a lot, but for every person writing for Forbes, there are 1,000 who tried and failed. Most fail because they don’t prepare, and when they pitch, they pitch poorly. If you follow the steps I’ve outlined above you’re already in the 1%. To show exactly how easy this can be, I just received this email from someone I’ve been communicating with who was able to get his boss into Forbes as a contributor. It was really pretty straightforward. I sent an email with a list of potential titles to [editor] saying that my CEO wanted to write for him. He responded pretty quickly asking for drafts of a couple of them, so I sat down with my content writer and wrote some outlines for [CEO] to fill in with his experiences. We went back and forth to edit the style to what [editor] was looking for. His biggest criticism was that we needed to embrace the struggle of entrepreneurship more. Once we’d produced a few pieces he was happy with, he set us up in the Forbes platform and sent us the publishing guidelines. We just published our second piece. What Is It Like As A Writer To Shop An Article Around?